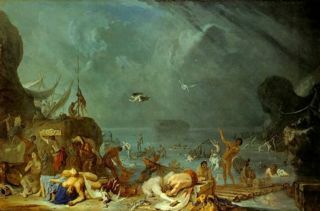 The Flood by Johann Heinrich Schönfeld. The Great Flood refers to the most catastrophic geological event that has ever taken place in human history. It was a unique, historical, and global catastrophe that lasted for about one year. Virtually nothing historical, from writings to civilization to long-living organisms like trees, has survived from before about 3000 or 3300 B.C., when the Great Flood occurred. Today 43–60% of Americans accept as truth the Biblical account of the Great Flood, and many cultures record a world-destroying flood in their oral or written histories. The Iceman, an experienced hiker, was frozen by a massive surprise ice storm in the Italian Alps 5,300 years ago—when the Great Flood likely occurred. "Among geologists, the concept of a catastrophic flood came to be universally accepted by the late 1950s," after a discovery in the American Northwest of "giant ripple marks, 50 feet high and 200–500 feet apart." This evidence of a massive flood in the Northwest suggests that the Great Flood was not merely a local flood in the Middle East. All cultures, not merely Christian ones, have an account of a great flood. Jesus specifically mentioned the Great Flood. This flood was the means of God's judgment on mankind because of the evil in their heart and actions. God warned Noah that He was going to destroy the world with a flood, because of the wickedness of mankind. Noah was to build an ark and take his family and pairs of each kind of air-breathing animal in it in order to be saved from the flood. After Noah and his family and all the creatures were on board, God shut the door of the ark. The flood was brought on by the bursting open of the fountains of the great deep and the opening of the floodgates of the sky. The rain lasted nearly six weeks (40 days and nights). The flood waters apparently continued to rise for 150 days, but it was just over a year before the waters had receded enough for the occupants of the ark to leave. The ark came to rest on one of the mountains of Ararat. God used a rainbow in the clouds as a sign that he would never again destroy the world in a flood. The Great Deluge, by Gustave Doré. The council of the gods decided to destroy mankind with a flood, but Utnapishtim was warned by the god who had made man, Ea, to build a boat to take all living beings. The length, width, and height were each 120 cubits (about 180 feet). It had seven stories. The gods got frightened by the flood and retreated to heaven where they cowered and wept. The flood lasted six days and seven nights, and was accompanied by wind and storm. Utnapishtim send out a dove followed by a swallow, but both returned, unable to find land. He then sent a raven, which didn't return. There are parallel themes going through most of the accounts of the Great Flood. Here are some of them. Many of the accounts say that the flood was caused by God or some equivalent being. In Genesis, it was Yahweh. In the Gilgamesh Epic, it was the council of the gods. In the Bundaba (Australian aboriginal) flood story, it was Ngowungu, the Great Father. The Greeks recorded it as being Zeus. When the cause of the flood is attributed to a god, the reason is frequently said to be for mankind's wickedness. Genesis adds that "every inclination of the thoughts of his heart was only evil all the time". The Miao account from China says, in verse, "These did not God's will nor returned His affection. / But fought with each other defying the Godhead. / Their leaders shook fists in the face of the Mighty." A Navajo account says that it was because of "their sins of adultery and constant quarreling". People were generally saved either by floating out the flood, or fleeing to the top of a mountain. In the former case, the vessel took a variety of forms. A Hopi Indian story has them surviving in the hollow stems of giant reeds The Greek story has them surviving in a chest. In Genesis, Noah was instructed by God to build an ark to dimensions and other specifications included in the account. The survivors were often a single family. An Australian aboriginal account has Ngadgja, the Supreme One, telling Gajara to take his wife, his sons, and his sons' wives. The Masai account from East Africa has Tumbainot taking his two wives, his six sons, and their wives. A Hawaiian story has Nuu taking his wife and three sons. Noah took his wife, his three sons, and their wives. The Flood, by Michaelangelo, detail from the Sistine Chapel, 1509. Genesis describes Noah sending out birds to see if there was yet dry land. Initially this was unsuccessful, but a subsequent attempt was successful when a dove didn't return. In the Hopi account also, they unsuccessfully sent out birds to find land. An Australian aboriginal account has a cuckoo not returning because it found land. The Masai account has Tumbainot sending out a dove, which returned because it had no place to rest. Genesis says that the rainbow would be a reminder that God would never again destroy the world with a flood. See more criticisms in the article on Noah's Ark and Flood Geology. Critics of the global flood suggest that the flood accounts are unrelated accounts of local floods, or stories influenced by the arrival of missionaries. However, Nozomi Osanai responds that "...the detailed nature of the widely spread statements has common elements to the Bible. In fact, even people who live far from the sea or in mountainous areas have flood traditions which are similar to the Genesis account." And Murray Adamthwaite responds regarding the missionary influence, "...that explanation fails since in many cases secular anthropologists gathered the stories before missionaries reached these tribes with the Gospel. In other cases missionaries have related how they indeed told the story of Noah, only to find that the tribal folk already had a similar tale in their own legends." The Great Flood has left a variety of traditions in many cultures worldwide. In most of them, the stories involve a few survivors and a number of animals in a boat or on a raft; the search for dry land involving a bird; a landing on a mountain, and a sacrifice to the gods after the flood was over. Chaldean Xisuthrus was warned of a coming flood by the god Chronos, who ordered him to build a boat in which to carry family, friends, and two of every kind of animal. Xisuthrus - 8 Yes; birds were used to find land. For a more detailed treatment, see Flood Geology. Flood geology is the study of the Earth's geology in the search of evidence for the Flood in the geology of the Earth. Some Young Earth Creationists point to the flood as the reason for the separation of Pangea, rather than the secular view that the separation was caused by plate tectonics over millions or even billions of years. The building of the ark by Bertram of Minden. In 2000, explorers discovered evidence that humans lived where the Black Sea now is and speculated the sea was created during a great flood. Dr. Robert Ballard expanded on this theory, postulating that the Black Sea was much lower during the Ice Age (including the finding of a beach thousands of feet underwater), and when the walls holding back the Mediterranean Sea at the Bosporus broke, the sea rushed in and drowned the inhabitants; those who survived told the tale orally, and according to Ballard this became the basis for the flood accounts of Genesis and Gilgamesh. This theory is for a local flood, and not the worldwide flood as recorded in Genesis and many other cultural traditions. It also doesn't fit with many other details of the Genesis account. In When the sky fell: In search of Atlantis (1996), Rand Flem Ath expanded on Professor Charles Hapgood's theory of crustal displacement whereby the entire earth's crust moved with respect to the core. The suggested date for this was about 10,000 years BC. If a displacement had occurred then it would have caused enormous disruption to the earth's oceans with massive tsunamis and heavy rain. Although the book was nominally about the disappearance of Atlantis, the theory of crustal displacement not only explains the discrepancies in ice thickness in Greenland and Antarctica but also the sudden demise of the mammoths. This theory could also potentially explain the widespread existence of flood accounts throughout different cultures. ↑ Mortenson, Terry (July 2, 2018). Noah’s Flood: a Unique, Historical, Yearlong, Global Catastrophe. Answers in Genesis. Retrieved July 4, 2018. ↑ Genesis does not say that this was the first ever rainbow. ↑ Australian Aboriginal Flood Stories, Creation Vol. 5 No. 1, pp. 6-9. ↑ 13.0 13.1 Greek, in Flood Stories from Around the World by Mark Isaak. ↑ 17.0 17.1 Hopi, in Flood Stories from Around the World by Mark Isaak. ↑ 19.0 19.1 19.2 Masai (East Africa), in Flood Stories from Around the World by Mark Isaak. ↑ 20.0 20.1 Hawaii, in Flood Stories from Around the World by Mark Isaak. ↑ A comparative study of the flood accounts in the Gilgamesh Epic and Genesis, chapter 7, by Nozomi Osanai. ↑ Oard, M.J., 1990. An ice age caused by the Genesis Flood, Institute for Creation Research, El Cajón, California. ↑ Proof of Noah's Flood at the Black Sea? by Creation Ministries International. This page was last modified on 9 April 2019, at 09:32.